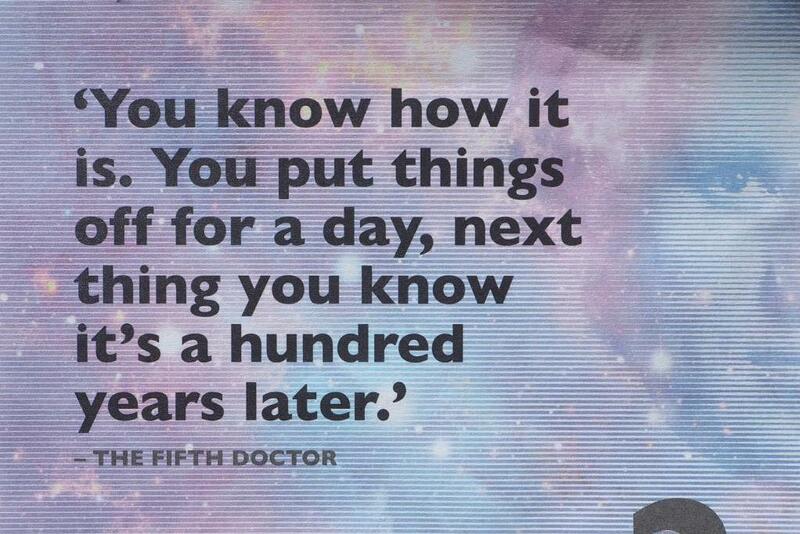 It’s time for some more wisdom from everybody’s favourite Time Lord. 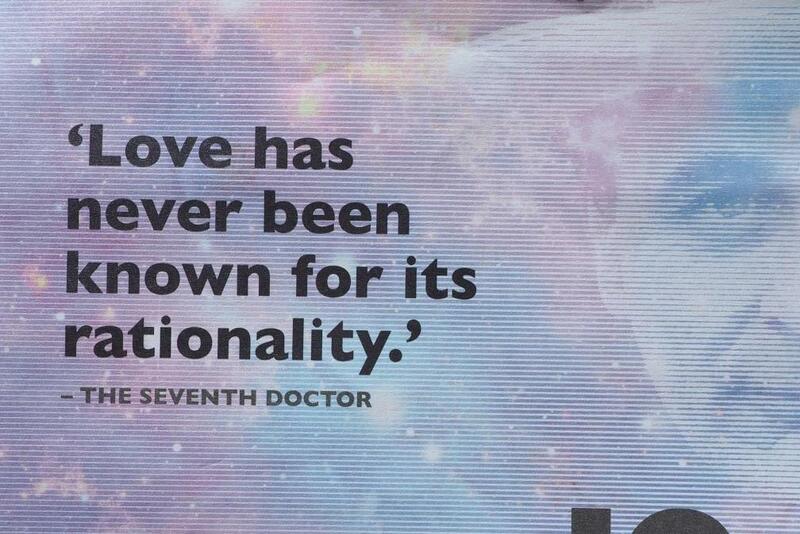 Some time ago, I shared some of the lessons I’d gained from my new daily calendar of Doctor Who quotes. 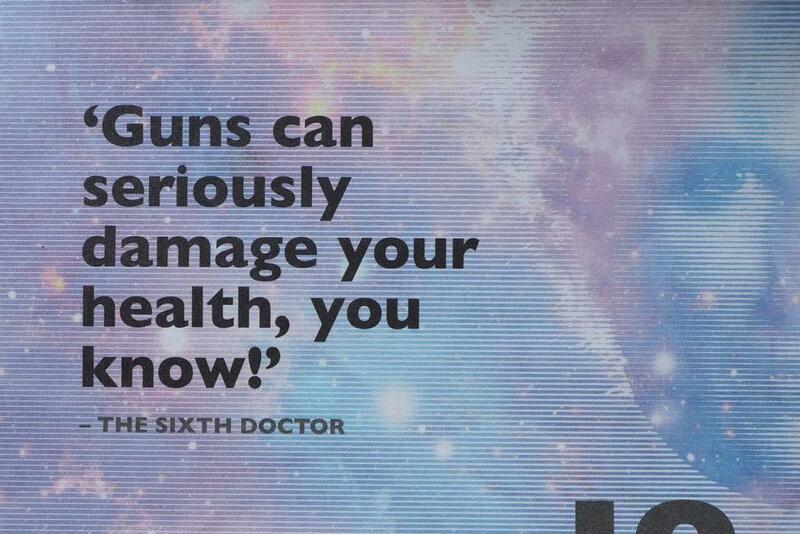 The advice has been rocketing along and so here are some more Lessons From The Doctor. Presumably you’re here to read my blog but this is a question I often ask myself. Yep, that question too. Usually when I’ve decided to take on a new and unfamiliar activity with people I don’t know. Gosh, this seems so pertinent in an election year. 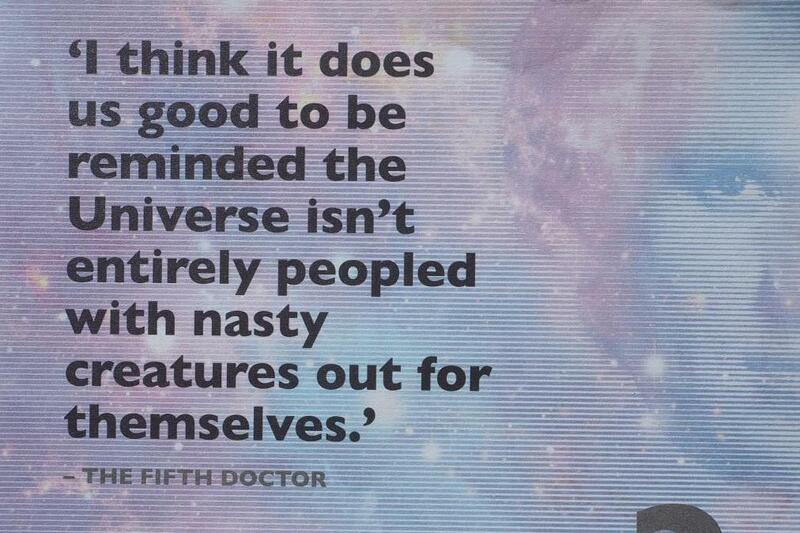 Also probably pertinent in an election year. Okay, so this is turning into an Election Year Calendar of Quotes. 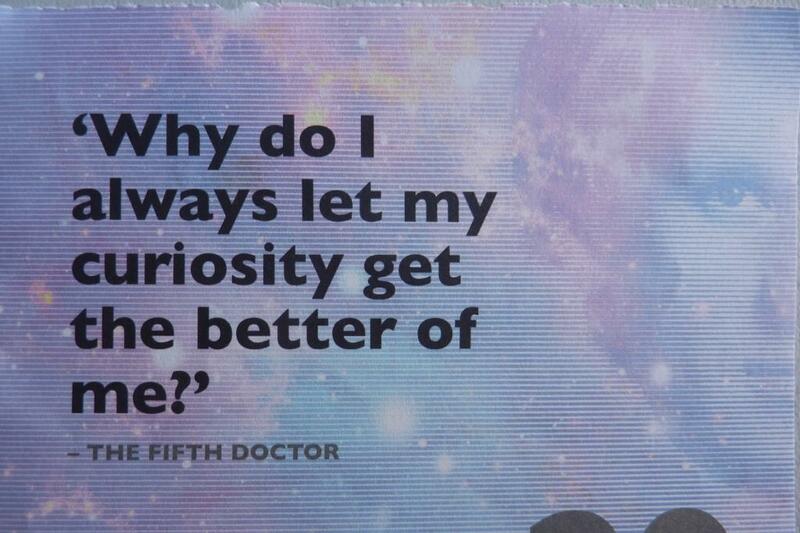 Or it’s also applicable to that thing that your curiosity got you into. Everybody knows this one. Okay, so maybe it’s actually only a month later but it sure feels like a hundred years. 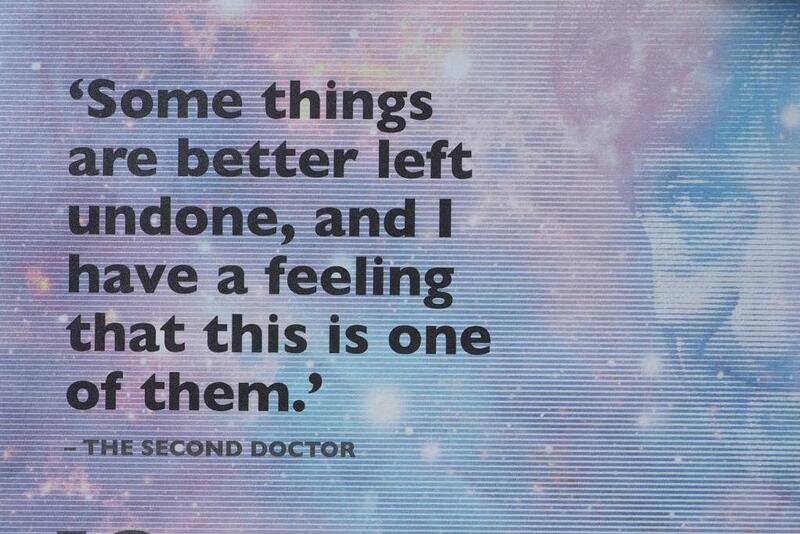 Ah, I love that the Doctor in one incarnation has an answer to himself in another incarnation. Let’s just forget about that thing we didn’t get around to, eh? In a world of social media, 24 hour news cycles and global consumerism, haven’t we all felt this one? 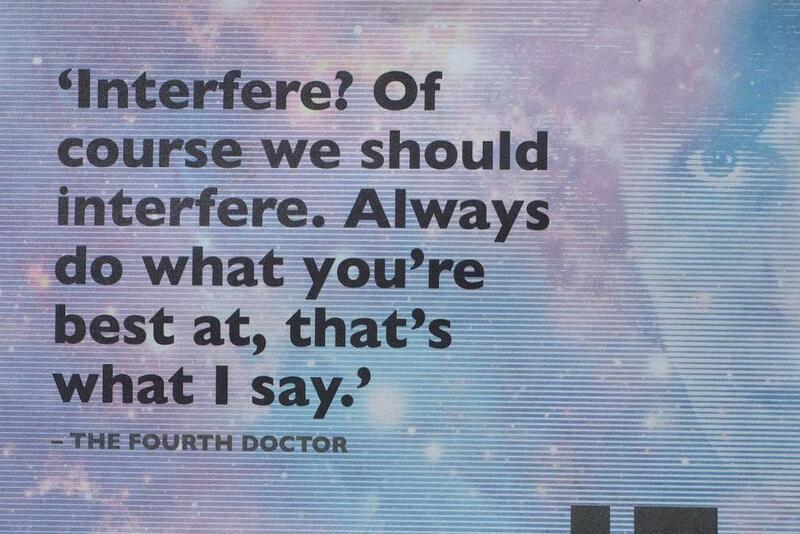 And that is your Time Lord advice for today. Now excuse me while I go and find a quiet spot to read a book….. I am not a fan of horror movies. I can’t take those…”slasher flicks” I believe they’re called. All that blood and gore and people being cut to bits with a chainsaw. But I do like to be scared. Deliciously scared. I love that phrase of Anne’s. 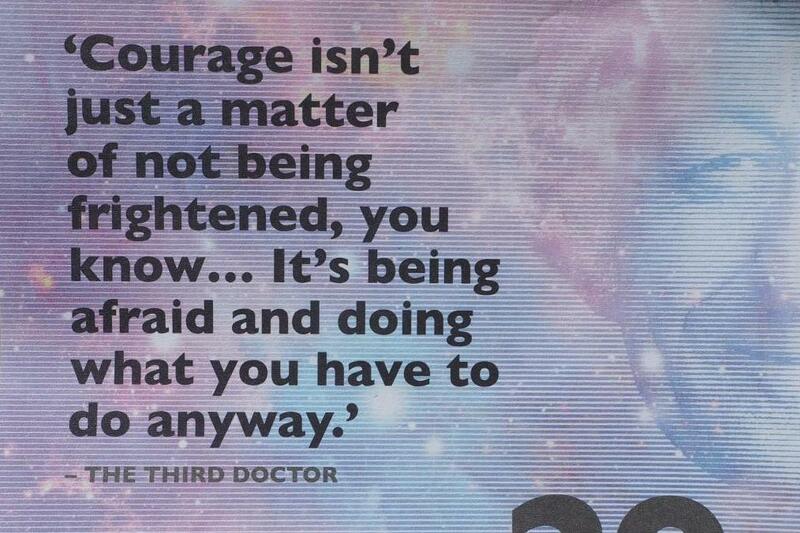 It’s not in the book, it just appears in the television series but it’s such a good description of the best way of being scared. All the great masters of fright knew that to truly scare people, you didn’t need horror in the form of violence and intimidation. It could be a mere door that would make your heart beat that little bit faster. Open or closed, a door leaves you wondering what is behind it or what will come through it. 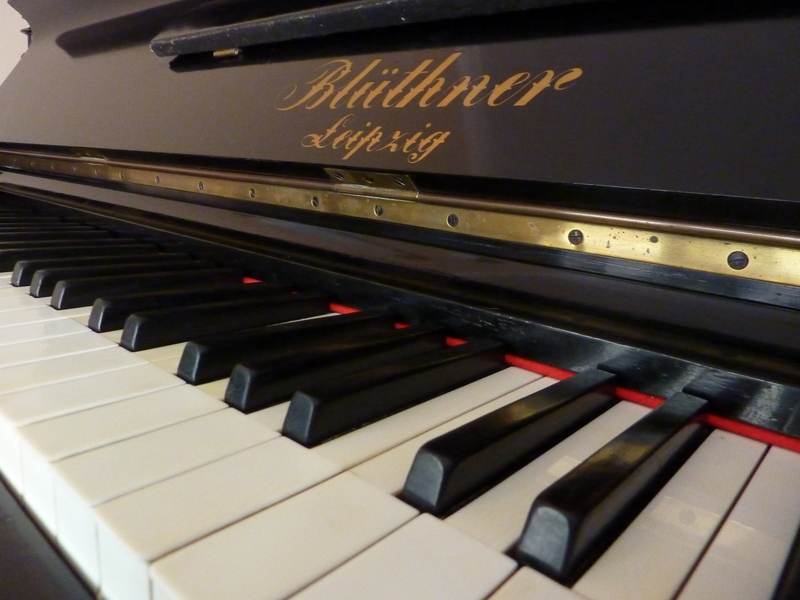 Your heart rises up in your mouth, you hold your breath…. Yes, the anticipation. Alfred Hitchcock certainly knew his stuff there. The “is what I think is about to happen, about to happen?” nervous thought. And then, because of the suspense, even when what we think is going to happen happens, we still jump out of our seats in fright. Recently, we took a Ghost Tour of the local old gaol. 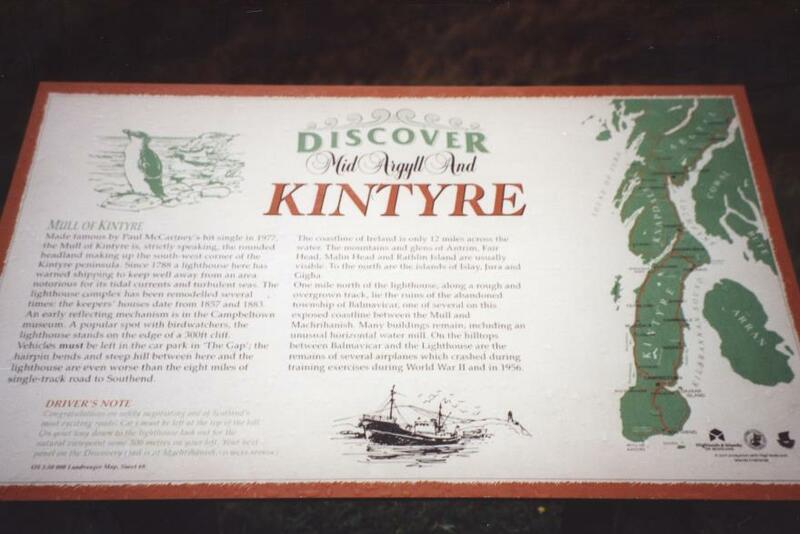 Built by convicts when the city was first founded, it’s a place of horrifying injustices and menacing history. The Ghost Tour is conducted at night with only small lanterns for light. To add to the atmosphere, we happened to choose one of the wildest and coldest nights of winter to wander about an old bluestone gaol in the dark. Shivers all round. The guide shared stories of various inmates and of course tales of those believed to still haunt the place. We were, at times, shut into cells in the dark while frightening stories were told, more often than not ending in a sudden scream. Were we scared? Of course. Did we love it? Of course we did. In the darkness, we would titter nervously. Jumping at the sudden screams, we would laugh at each other. “My, aren’t we silly?” we would see in each other’s faces and then try not to run as we made our way out of the cells. I’ll confess here that the scary movie that has had the most profound effect on me is The Sixth Sense. The story of a boy who can see dead people haunted me for years. My boys were mere babes at the time and every time one of them screamed unexpectedly in the dark at night, my heart would beat a little faster and I would have to quash the urge to turn on the light. The Sixth Sense was one of the best movies to play on our fears of the unknown, of the dark, of things we don’t understand. And to play on that thought of “this could really happen”. It wasn’t gory or over the top. The scary scenes were played almost casually. A boy with his head half blown off wanders casually into the child’s lounge room. It was the normality of it that made it all the more frightening. 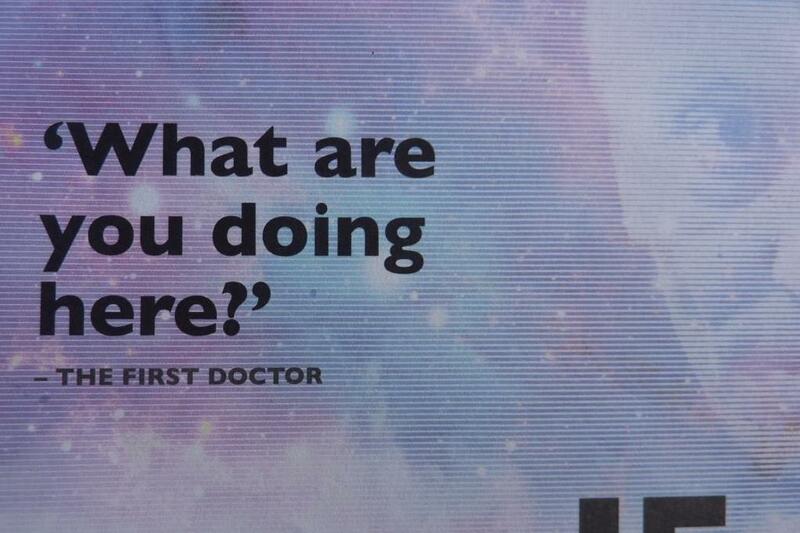 Doctor Who writer Steven Moffatt is a master of the spine-tingling fear of monsters. The television series has been frightening children for more than 50 years but Moffatt has been responsible for introducing two of the most frightening new monsters the series has ever seen. One is the Weeping Angels (previously written about in this post) and the other is The Silence. Both of these monsters play on the same fear – that which we know is there but we cannot see. Is there anything more frightening than knowing there is a danger but being unable to see it? That digs into our deepest childhood fears. The noise of the wind that sounds like a ghost, the dressing gown on the back of the chair that suddenly becomes a crouched man in the dark, the awareness of space under the bed and what might be lurking there. Pixar tapped right into those deep-seated fears with their movie Monsters Inc. But I can’t help wondering how many children were actually helped by the personification of the monsters that haunt their bedrooms into everyday people who go about their job of scaring small children and who are just as afraid of them. Scary books are easier to handle. We can stop reading at any time, go and do something else, take the scary bits in small doses. But books are also, therefore, great ones for granting that delicious scare that we love. 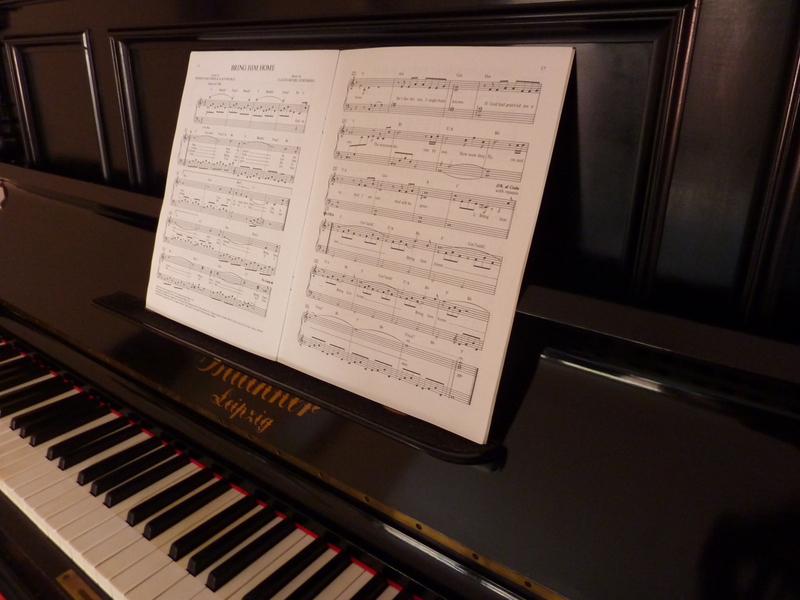 From Grimm’s Fairy Tales to Stephen King, the opportunity to make our hands go clammy, our hearts beat faster is there for the taking whenever we want it in whatever dose we think we can take. I rather love to be scared but only in that tingly, caught-breath, delicious way. Do you like to be scared? What scares you? It all started with an angel. 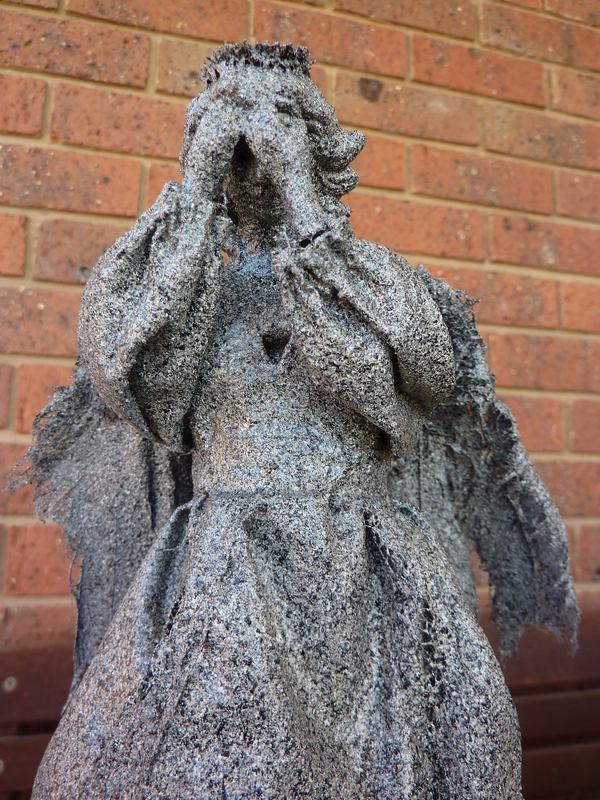 A weeping angel to be exact. 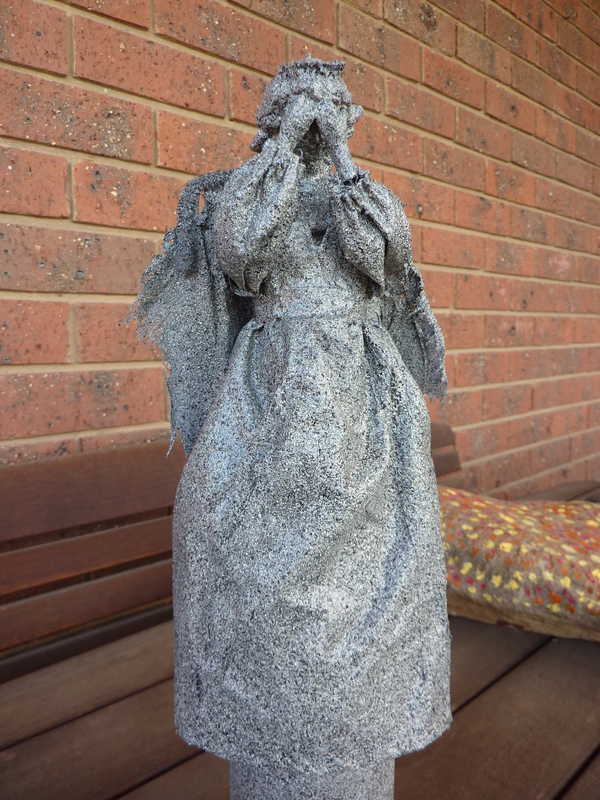 Well, a Weeping Angel. One that needs capitalisation. 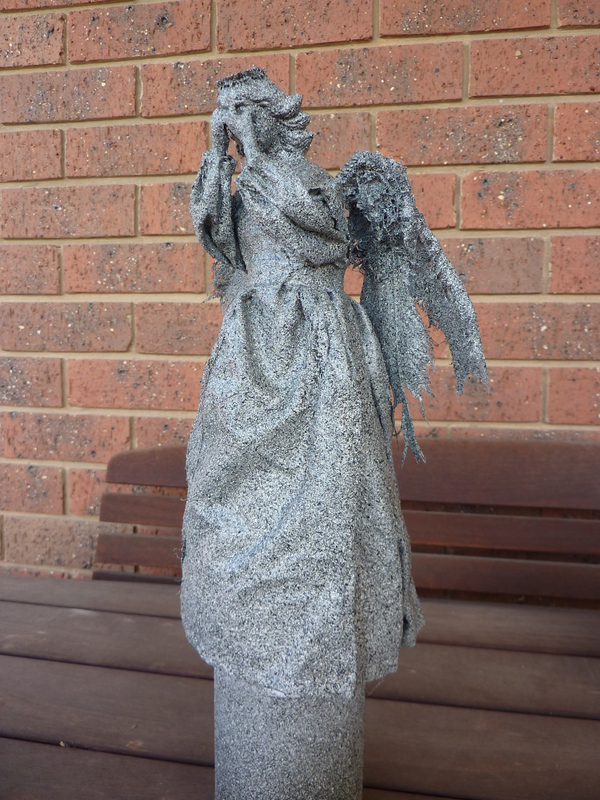 And then, this year, the ever-increasing Doctor Who merchandising machine introduced a Weeping Angel Tree Topper. You heard right. One of those to put on top of your Christmas tree. Well, because we do things a bit differently in the MOSY household. And we’re not the only ones. I waited too long and they sold out. Seriously. Devastated, I frantically searched the interwebs for anywhere that may still have one. 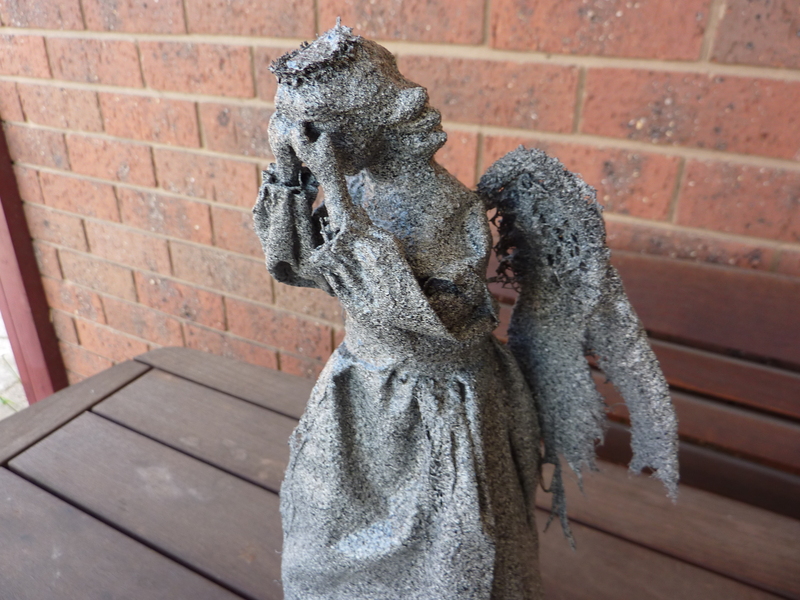 And then I stumbled across a blog post explaining how to make your own Weeping Angel tree topper. Oh, that’s more like it. We love a craft project in this house. I can’t show you a photo of the angel I started with because, believe it or not, I don’t always do things with the thought, “I’ll blog about this.” I was just keen to get started. Needless to say, the $3 angel I found was crappy, all gold and white and serene-looking with ribbons and weird, fat, fabric wings. 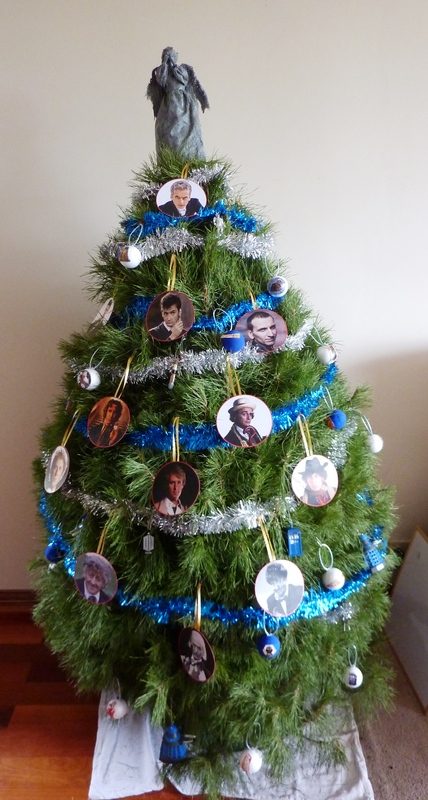 But, really, if you’re going to put a Weeping Angel on the top of your Christmas tree, it only makes sense that the rest of the tree should match. 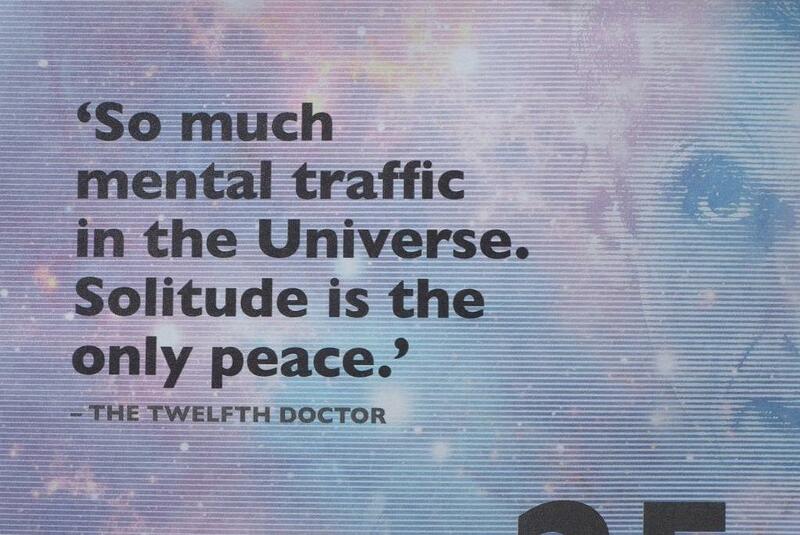 So, have yourself a Wibbly Wobbly Timey Wimey Christmas and whatever you do, DON’T BLINK! When my boys were young, I loved to throw them a birthday party at home. We would pick a theme and everything would be based around that – invitations, games, activities, food, prizes, lolly bags – the works. Cowboys, wizards, astronauts, the alphabet, Cat in the Hat – we had a lot of fun. In an era of contracted-out birthday parties at play centres and fast food joints, ours were something of a novelty. My favourite, though, would be the year my eldest had a Knights of the Realm party. I spent months saving up the cardboard discs a local pizza restaurant used for their takeaway pizza (we also ate a lot of pizza in those months). I spray-painted them silver, attached a vinyl strap and stuck paper to the front so the kids could create their own crested shields. Dressed up and with their trusty steeds (made from shoeboxes and the inner cardboard tubes of rolls of fabric), we held a jousting competition in the front yard. The cake, of course, was a castle. The lolly bags were the pièce de résistance. I made leather pouches. I can get carried away. The parties were only every second year and they stopped once they hit twelve years of age, giving way to easier movie/bowling/sleepover versions. 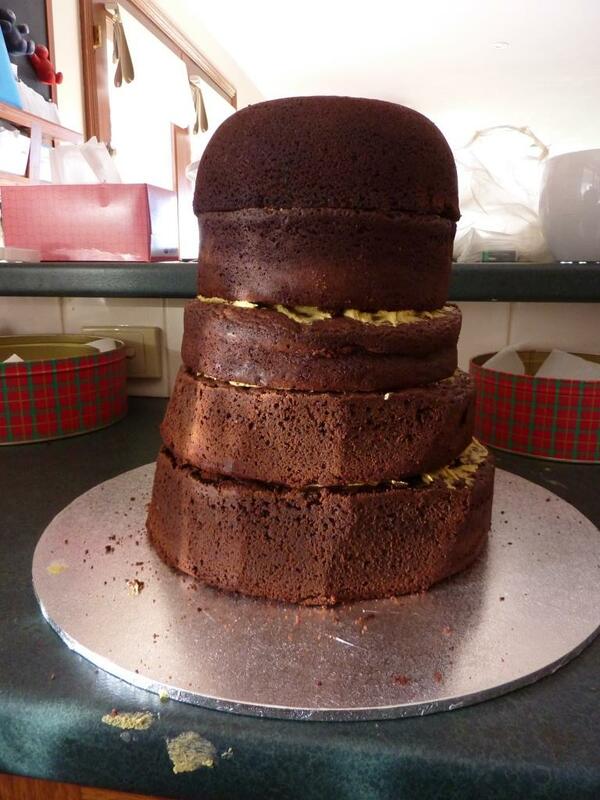 But I do still love to have a crack at a good cake. The Eldest Son turned 18 on Friday. I am now officially a parent of an adult. Don’t give me the argument about it being 21. Here, everything hits at 18. They can drive, drink, vote, gamble, get married. 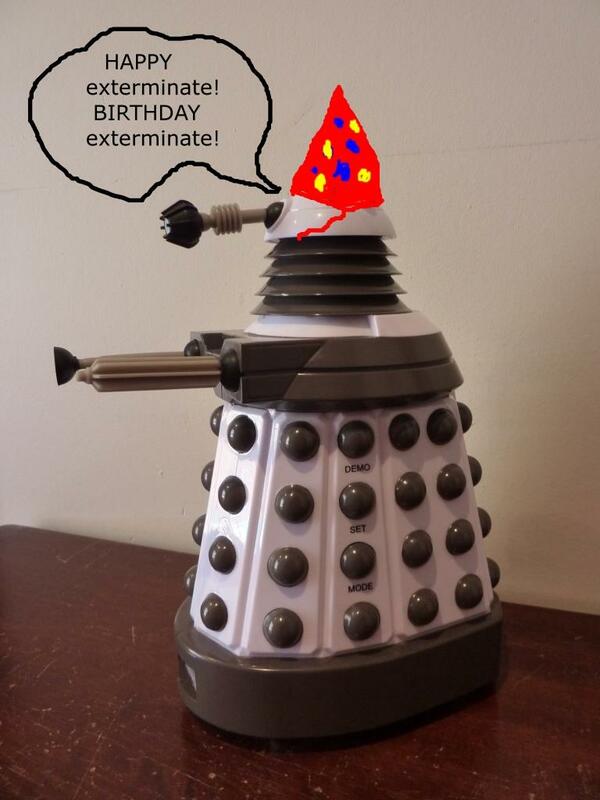 You hope not all on their birthday. A significant birthday demanded a significant cake. 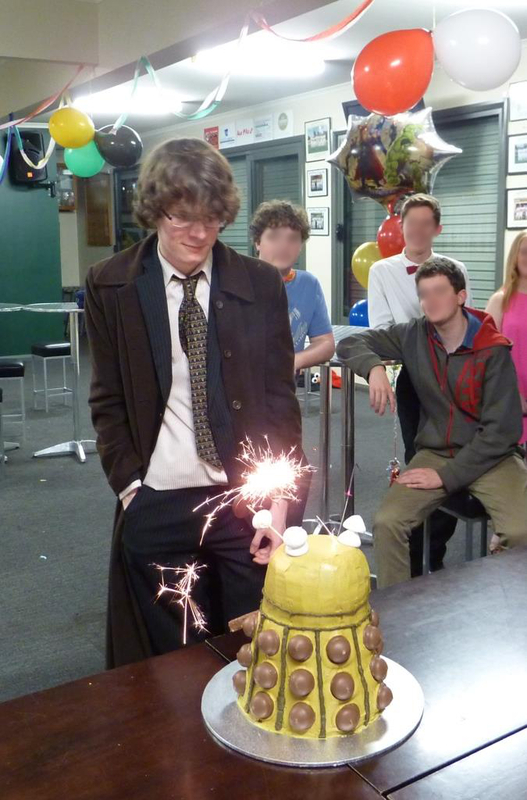 The theme for the party was Pop Culture and as Eldest Son was going dressed in his customary 10th Doctor costume, a Doctor Who themed cake seemed mandatory. It took me two days to make it. 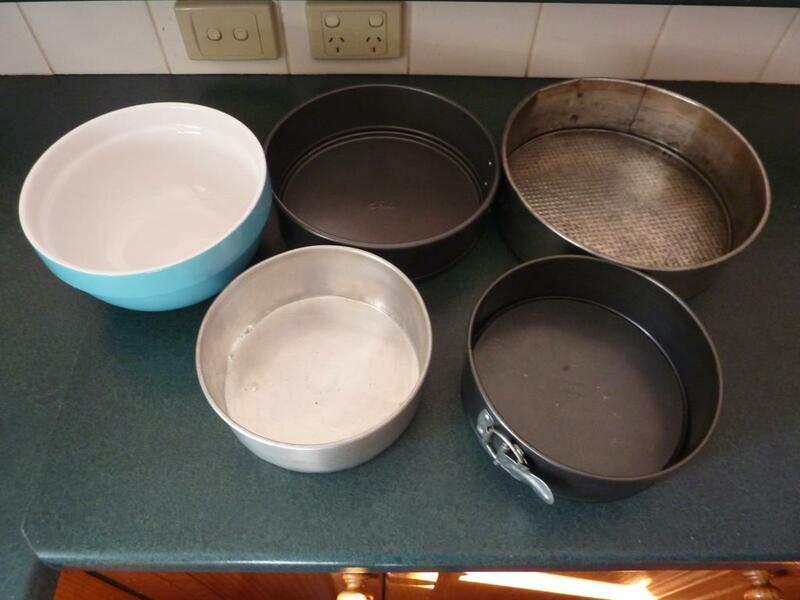 One to bake the cakes (five of them) and one for construction and decoration. Being a Jack of All Trades, I was, of course, making it up as I went along with nothing but an image in my head and a half-baked (ha!) idea of how it would work. I’ll confess I was really happy with the result. As was Eldest Son which made me even happier. 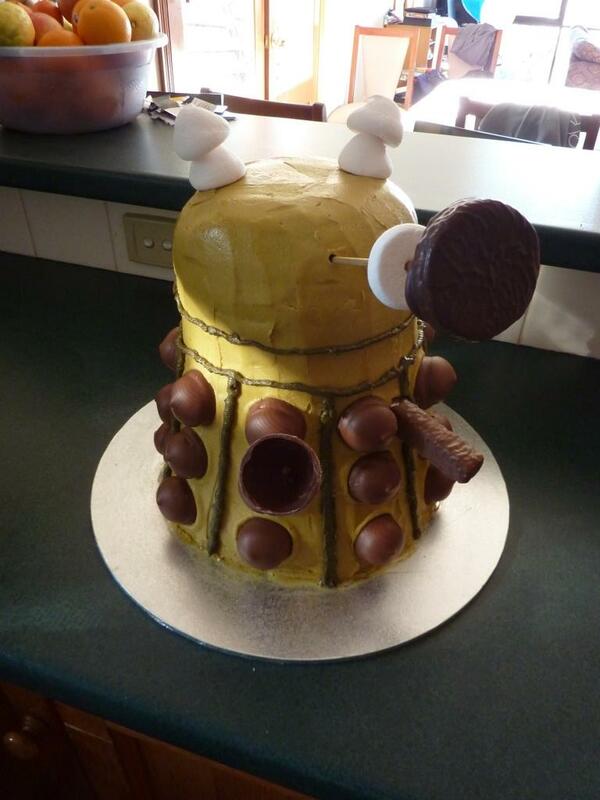 Take these and my favourite mudcake recipe and build a Dalek. No worries. Okay. So somehow I have to turn all this into a Dalek. 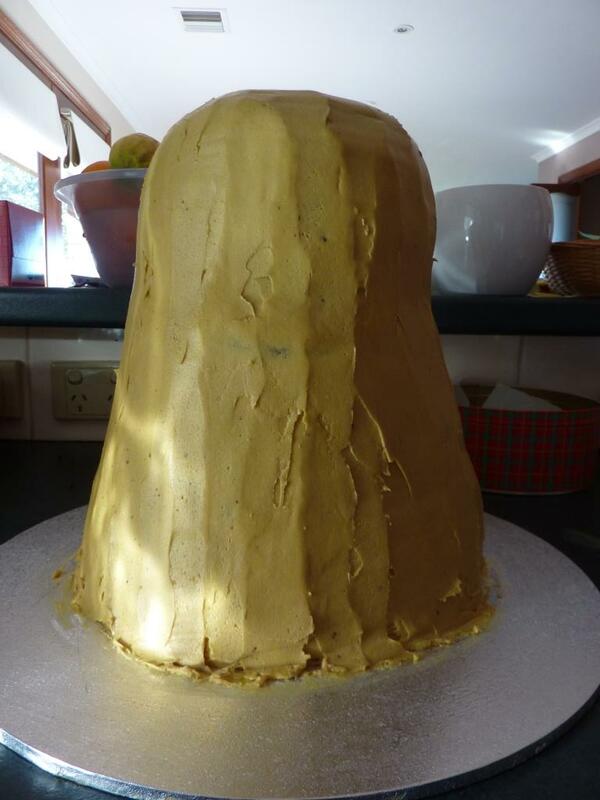 I could have saved myself a lot of work and just stopped there and called it a Cousin It cake. The finished product. 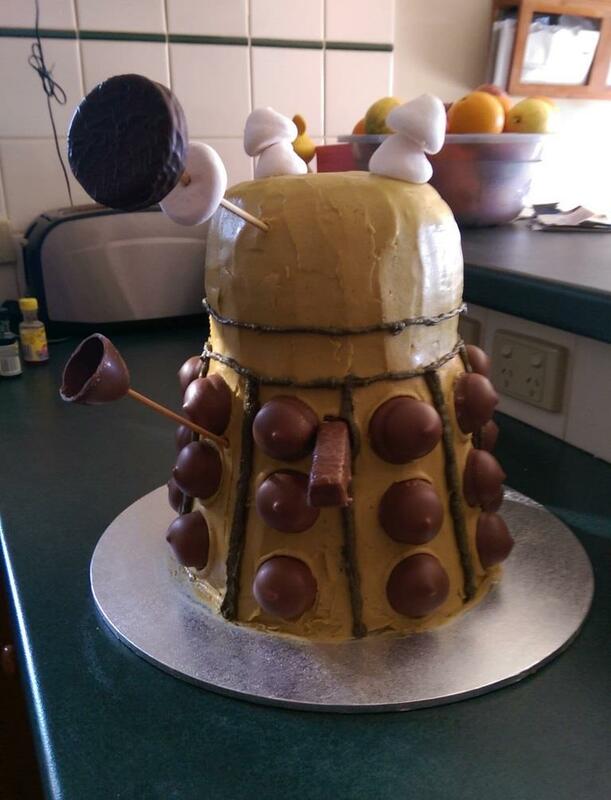 This cake could actually kill you. 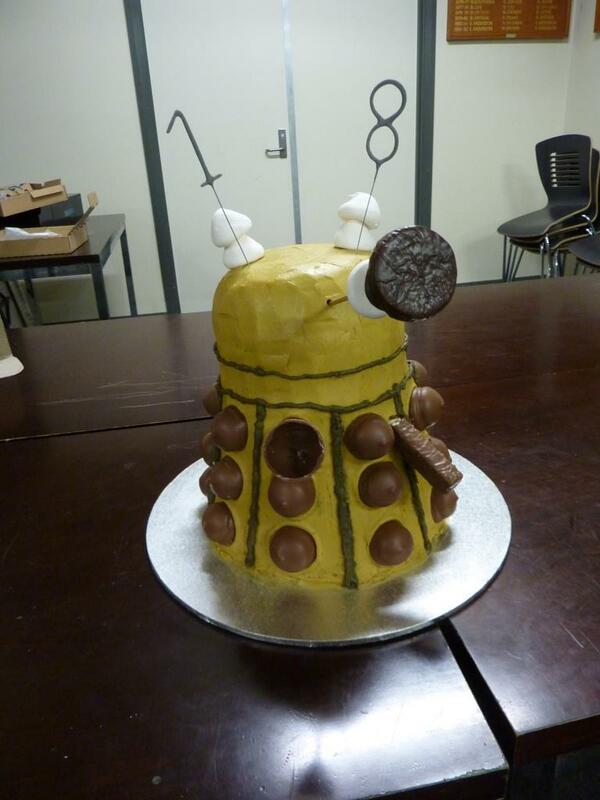 It has 1.2kg butter, 1.2kg sugar, 1.2kg chocolate and 18 eggs in it. 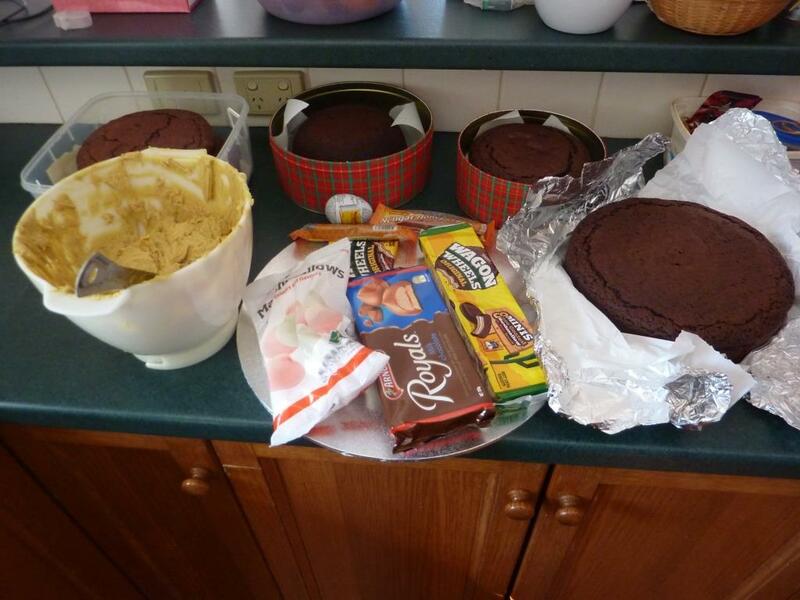 And that’s not counting the icing and decorations. I think I’m proudest of my inspired Wagon Wheel eye and half a Kinder Surprise chocolate egg suction cup! The birthday boy with his cake, just to give you some perspective on the size of the thing. We’ll be eating cake for the next month.